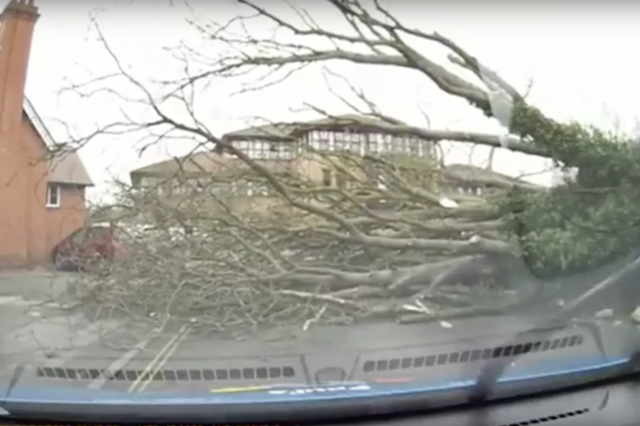 Terrifying dashcam footage shows the moment that a massive tree fell into the path of an oncoming car after being blown over by Storm Doris. The video was captured by driving instructor Paul Smith as he was travelling through Spalding in Lincolnshire around midday yesterday. Smith, 50, told the Spalding Voice: "As I came around the corner I saw two branches near the bottom of the tree break off and I thought 'that's going to come down'. "Then, the very next moment, the whole thing did. "Two or three branches landed on my car. "I was very lucky because when a tree like that comes down on a car there's only ever one winner." Smith had dropped off a learner driver just moments before the high winds uprooted the tree. He said: "As I came past The Fitness Centre I saw a lamppost lying on the side of the road, which might have been blown down, and a policewoman was in the doorway. "You can see her in the dashcam footage. "Then when the tree came down, she came running past me and went to the tree to check if there was anyone under it. "She gave me the thumbs up and I did the same to say I was OK."